The Fellowship was fortunate enough to obtain a copy of STRAY #1 from Action Lab Entertainment. The story is written by Vito Delsante, illustrated by Sean Izaakse, and colored by Ross Campbell and Simon Gough. Rodney Weller used to be Rottweiler, the sidekick to the famous superhero Doberman. Now, all grown up, he’s a club promoter and deals a deadly drug called Godsmack. Rodney is arrested when one of his clients commits suicide. It’s then he is informed that his former mentor (and his real dad) the Doberman has been murdered. While not an original story, Vito Delsante does weave a very interesting tale. I’m very much interested in finding out how and why Rodney lost his way, and if this is what it takes for him to get back in the crime fighting game (I'm assuming yes). I’m not familiar with Sean Izaakse’s work, but I like what I see. All in all, I really enjoyed this book and wouldn't mind seeing other adventures with these characters, past or present. There are very few superhero books out there that aren't put out by "those two." This is a good one to grab. 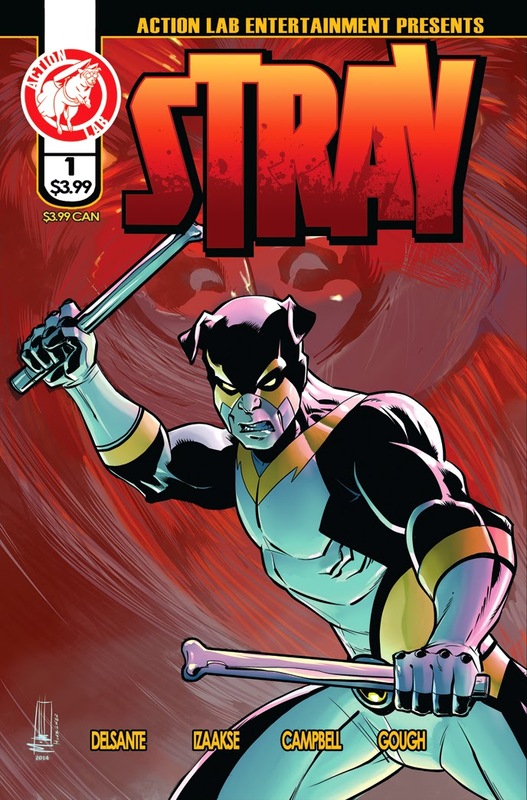 STRAY #1 is in stores now, or available for ordering at www.actionlabcomics.com.